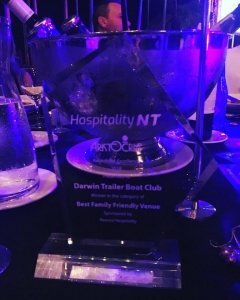 Wednesday night at the AHA Excellence Awards the Darwin Trailer Boat Club was named as the NT’s Best Family Friendly Venue. Whilst it’s great to be awarded the accolade, the most important thing is to actually be the NT’s Best Club for Families. Many thanks to all the Staff and Council for this great achievement. We couldn’t be more proud of this Award! Our next family event will be the Tuesday Night School Holiday Movies Under the Stars. More info about AHA NT here.